Really appreciate the work you put into bringing this information to us. Programming will be a pain if one has only Mac’s unfortunately… but I do like the features of this radio. Am planning on getting my tech lisc. for ham radio and have been really hoping for information on more long distance radios. Hopefully, in an affordable price range. If you choose not to do an article on LD radios maybe you could point us towards a good web site, etc. As regards programming and Windows, have I got good news for you. The programming software I’ll be recommending in the next article (about how to get best use from these radios) – CHIRP – runs on Macs as well as PCs, so that will not be a problem for you at all. As regards longer distance radios, the ‘secret sauce’ in those radios becomes as much the antenna rather as the radio itself, and you need to have not a Technician license but a General or Extra license to be allowed to use the frequencies that support longer distance comms. The Technician is mainly for VHF and UHF frequencies, or for some Morse code in the HF band. The only exception is a very thin slice of the 10 m band, which is at the cusp of HF/VHF and generally not very good for long range propagation anyway (it is much the same as CB frequencies and most of the time, they’re little more than line of sight). My thinking has been by the time someone has gone to the trouble of getting a General license, and certainly by the time they have an Extra license (which I do), they no longer need ‘how to’ articles but instead can work things out themselves and/or can digest much more complicated dissertations including Smith charts and all sorts of other things. But I do agree that preppers need both local area comms and wider area comms too; at the very least, I’ll do an article on that topic. One more comment – for the people who think ‘Oh, I’ll just buy the biggest best radio I can find, now, then WTSHTF I’ll take it out of its box and use it and there’ll be no-one to stop me’; that’s not realistic. As I said a couple of paragraphs before, long distance radio is as much a function of your antenna as it is your radio, and there’s a lot more ‘art’ as well as science in mastering long distance propagation. It is perhaps realistic to plan to store ‘illegal’ VHF/UHF HTs and to start using them for short range comms in an adverse future situation, because such things can work reasonably well right out of the box. But an HF radio? Have a look at an advertisement for one and see all the knobs and dials and switches and controls, and that should give you a quick feeling for some of the complexities involved in setting it up in a fully optimized configuration. Thanks for narrowing the perspective, I am on it…! You may also get your General license on the same day, and for the same testing fee. If you are able to pass the Technician test, you may then, free of additional charge, take the General test. I was able to do this in about 35 minutes, and now have my General class license. You may also take the Extra exam at the same time, but it is much more difficult, and you would be unlikely to pass. We love these. I’ve written many a review about the BaoFeng’s. Great post! I’d have to disagree with the comment about Macs. I use CHIRP on Apple OSX with the appropriate driver and VIOLA’. My UV5R was recognized immediately. Programming & cloning was a breeze. First rty and I have my UV up and running. Thanks for the good news about Macs and CHIRP. Good stuff about the UV-5R, but there are a “few” differences between the original UV-5R and the cousins in the UV-5R family. Whether or not they are of importance to you is an individual choice. First, many of the UV-5R cousins (UV-5RA, -RC, etc.) can’t use the extended battery option without modification to the battery. That’s not hard to do, but if you overdo it and the battery won’t stay attached, don’t expect any dealer to gleefully exchange it. Baofeng is now shipping a second version of the already modified battery, but most Chinese sellers on E-Bay and Amazon don’t carry it, since the original extended battery is still cheaper. Second, as is common to most industries (including radio), manufacturers are constantly slip-streaming in new improvements into their products, normally without much fanfare (at least as long as they still have stock on the “old stuff”). If you compare a two-year old original UV-5R to one made last month, you’ll notice several improvements to the receiver board. Third, most models being imported on E-Bay and Amazon today aren’t meant for the U.S. market, and thus have no FCC Part 90 sticker (including the overly hyped BF-F8HP 8W unit). If you care enough to want a radio with the Part 90 certification, you might want to check out the newer BF-F9 V2+ unit, which also has the 8W power level. As you have already pointed out, the antenna really makes the difference, the only problem being that so many Nagoyta’s and Diamond’s being shipped are cheap fake copies (but that’s another story). Anyhow, just taking a break (at this weird hour) while developing frequency templates for this weekend’s Yuma, AZ hamfest (most hams have difficulties programming the Chinese stuff as well), so we have ready made local templates (San Diego, Yuma, etc.) ready to go when they stop by the booth. First, you must realize that Baofeng Tech is just another seller based in North Dakota (they are NOT Baofeng corporate based in China). I deal with Baofeng China every few weeks. Second, of course a seller in ND (Baofeng Tech) is going to promote their radios in stock vs. what they choose not to carry. Their “analysis” is highly debatable among those of us that sell many different versions of Baofeng products (not just a select few). That’s like asking Ford to honestly rate Chevy, it’s just not going to happen. For example, they were advertising the “sole” 8W radio for months when Baofeng had already introduced another model with both FCC Part 90 certification (that the BF-F8HP doesn’t have) and the other unit (the BF-F9V2+) had all of the firmware bug fixes (that plagued some early owners of the BF-F8HP model – which is one of the reasons it was removed by Amazon for several weeks, they got tired of all of the returns for the Baofeng Tech BF-F8HP model). The folks at Baofeng allow dealers to order the model with any antenna or battery option that we choose, it happens that we order the BF-F9V2+ with exactly the same antenna as shipped with the Baofeng Tech BF-F8HP model, so their “analysis” of comparing their radio to one other seller that chooses to order the shorter antenna is misleading, at best. As I’m sure you already know, the entire hype about running 8W (vs. 4 to 5W) is very misleading. If you take a 5W radio (with the same antenna and height) and compare the received signal to an 8W radio (any model you like) with the same antenna and height to a third-party observer at a few miles distance, the difference in signal strength is about .25 of one S-unit in signal strength – it hardly matters a bit. In fact, since Baofeng doesn’t actually have a “real” signal strength meter (in either radio), you’ll have to get somebody else that owns a radio with a real S-meter for the test. All Baofeng’s will either shown a full-scale signal or nothing at all, even when the incoming signal is all noise. Of course, if you compare an 8W radio (with a better antenna) to a standard 4-5W radio (with a crappy antenna) you’ll see a much bigger difference, which is exactly what most users fall for in the hype around the 8W units. It’s normally the first Baofeng radio they have owned with a half-way decent antenna, so it’s a common mistake for them to assume that it’s the extra POWER that’s making all the difference. Swap the good antenna (from the BF-F8HP) with a standard UV-5R and the signal strength on the UV-5R will jump up alot. The major difference is the antenna – period. We simply got tired of trying to educate some of the folks that don’t believe physics, so we now offer an 8W radio as well (with a newer 10W rig coming out soon), but honestly most of the prepper community (that we deal with) are far more interested in other brands that offer scrambled audio and/or compandered audio for a more secure communication experience. Thanks for another helpful commentary. I completely agree – and have said so many times in the various articles here – that antenna quality is much more important than transmit power. A better antenna boosts both your transmission range and your reception range too. On the other hand, having said that, there’s nothing ‘bad’ with extra power per se, although it is inappropriate to use more power than the minimum required, both from a battery life point of view and wanting to limit how far one’s signal goes. Talking about that, your comment about scrambled audio is interesting. As you know, scrambled audio is not permitted, at least not in ham transmissions, by the FCC. Maybe it makes sense to deply scrambled audio in a post-apocalypse sort of scenario when ‘opsec’ and ‘comsec’ is more important that obeying FCC regulations, but at present, it is an unnecessary way of drawing attention to yourself, and some hams do love to track down people who are violating FCC regs. All true, but you may not realize that other bands (that these radios cover) do allow for audio inversion. Icom has just introduced two more radios with that feature for use on the marine and business bands. Remember that it takes a 4X increase in power for a 1 S unit increase in signal strength, of course as I said previously, all Baofengs show every signal at full scale. Got to go, we’re on our way to the Yuma, AZ hamfest. I think we’re more in agreement than not on most things. So, let me ask you – which do you recommend people should buy? UV-5R type radios @ $30 or so each, or the higher power units at $55 or so each? I don’t think there’s either a right or wrong answer to this, so am interested to get opinions from others who clearly know what they are talking about, so readers can make a more fully informed decision. Just got back from the Yuma, AZ hamfest. Agreed, we’re probably 80-90% in agreement. As to your question, it all depends of what the individual(s) want, what their budget(s) are, whether or not they are hams already, whether or not they plan to become hams soon, etc., etc. I’ve said many times that any radio is better than no radio (same with guns IMHO), so we try to point out various options than some (certainly not all) folks might be interested in. Hams (normally) favor more memories than fewer memories, as they normally want us to program in every repeater available in their state (or at least their area of the state), and they tend to want cross-band repeat functionality (most preppers have no idea what that is). In “some” states programming in every repeater is totally doable for us (depending on the radio choice), in other states that’s not going to happen with only 128 memories (like the UV-5R series and many others). Generally speaking (there are certainly exceptions), preppers generally put more emphasis on reliable simplex communications (having next to zero repeater capability) and a greater level of secure communications, so they are willing to give up some memories to get the ability to scramble their transmissions, or they want extended transmit times, or the ability to transmit over a wider frequency range. “Most” hams use handheld radios only on occasion and use 50W (or more) mobile radios for the vast majority of their communication needs, whereas most preppers tend to view a handheld radio (HT) as their primary way to communicate – that creates two different ways of looking at radio communication plans. For example, we sold as many mobile radios at the Yuma Hamfest as we did handheld radios. Next weeks Tucson, AZ Prepperfest show will probably be the opposite, many more HT’s will sell vs. mobile radios. In general, hams tend to understand the technical side of various radio trade-offs better, so the fun really begins when we’re asked by a prepper (that’s also a ham) to recommend some radios to consider. 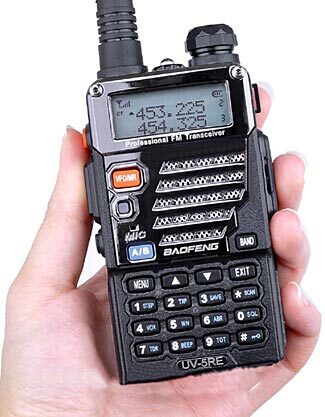 If they are looking for a cheap, throw-away handheld radio, clearly it’s hard to argue against a Baofeng UV-5R (or any of their various cousins). So long as they understand it’s limitations (like it normally being sold on the internet with a crummy antenna and no FCC Part 90 certification), the fact that the receiver has serious interference issues in any hot RF environment, it has only 128 memories, etc. – then the radio will meet it’s user requirements and they are generally happy with it (and it’s still far better than walking around counting on an FRS radio). The 8W Baofeng radio (previously mentioned) comes in several versions (the non-FCC Part 90 certified BF-F8HP version and the FCC Part 90 certified BF-F9V2+). As I’ve said before, the few extra watts does literally nothing in real-world distance gain, it’s the antenna change on these radios (vs. the standard UV-5R) that makes the difference. Some sellers order the BF-F9V2+ with the standard crummy Baofeng antenna (to get costs down), we don’t play that way. Unless the customer specifically asks for the shorter antenna, they get the better performing antenna with their shipment. A better radio, in my opinion (if the user wants a more secure communication plan, a better receiver, or wants more than 128 memories), is the TYT TH-UV8R with the optional audio inversion chip (aka scrambler) and 256 memories. With the optional audio inversion chip, they sell for $79.95, but even if the user never uses the scrambler (or never uses the compandered audio for greater simplex range), he (or she) still gets a better antenna, a far better receiver, and twice the memories (vs. the Baofeng UV-5R series). TYT is expected to introduce several new radios at the IWCE show in Las Vegas next month (we’re going), so if they bring out something really interesting, I’d be happy to pass it on. “If” the buyer is a ham (and simply doesn’t care about secure comm needs, but really wants more memories or the ability to use cross-band repeat in a handheld radio), I’d suggest the Wouxun UV-8D with 999 memories (but only with the real 2600 mAh extended battery, as some dealers sell the radio with the 1800 mAh battery and claim it’s an extended battery – what a joke, since that battery will power the radio for a day at most with the radio’s display turned on). You said that “All these worries evaporate if you obtain an amateur license.” They don’t evaporate because if you have an amateur license, you can only talk to other people who have an amateur license, which is no one in my family. I am not going to get my wife and kids to get an amateur license. It would be crazy to even ask my wife – should just get upset that I have time for hobbies while she does so much to take care of housework and the kids. So basically, we are back to using our amateur radios on MURS, FRS, or GMRS frequencies so that we can talk to other “regular” people who are unlicensed. First, I’m talking about the problem of communication distance, not of your wife’s (or mine) perception of our communication requirements. I finally got my wife to get her license some years ago by explaining that if the car she was driving broke down in many areas of AZ she’d have little (to no) cell coverage, and with a young child in the car, it was simply a matter of “safety”. That got her to study, and now she has her Extra Class license. Of course if your wife absolutely refuses, you could always work on the kids. The youngest ham that I know of is 5 1/2 years old and lives in Colorado Springs, CO, so perhaps it’s just a matter of you targeting a different family member. The ARRL Field Day event was this past weekend, that would have been a great way to introduce you (or other family members) to the major advantages of having a ham radio license and being able to access over 22,000 repeaters nationwide with just the beginning Tech license. If you are always within range of a FRS, GMRS, or MURS simplex signal, then you are correct that your communication issues (within your family at least) are solved, but you’d better hope that if any major event ever happens everybody is within 3 to 5 miles (at most) of home or they will be out of range. Even “if” you are the only family member with a ham license, being able to talk to another ham (in your area) that can relay information to your family can easily be done, as most hams also have the ability to use FRS, GMRS, or MURS frequencies if the situation warrants it. – is anything but assured. We got in two new TYT units that are very interesting. I haven’t had time for a full review, so let me just pass along some highlights of each one. First one is the TYT MD-380 DMR/Analog UHF radio. It’s just beautiful, no other way to say it. Not only is this radio fully MotoTrbo compatible in the digital world, it’s also an analog radio as well – meaning that you can use this one radio within a typical Motorola business setting, AND still use it on analog UHF ham radio frequencies. Did I mention it has 1,000 memories and comes with two antennas and a programming cable in the box? This radio will seriously cause Motorola some sales heartburn within their MotoTrbo accounts with a price of only $199.95. Typical MotoTrbo (digital only) radios sell for 3 to 4 times that price. Good luck getting a cable and software to program the Motorola branded radios on your own. Second radio is one that will be of the most interest to the Prepper community I think. Months ago I mentioned TYT was going to announce a 10W dual band analog radio. I saw the prototype at the IWCE trade show in Las Vegas, but formal pricing and specs wasn’t available then, but it is now. For $109.95 you get 256 memories (vs. 128 in all the Baofeng series radios), a 3600 mAh extended battery as standard (vs. 1800 in the Baofeng UV-5R series radio or 2200 mAh in the BF-F8HP), two antennas standard (one is 7″ and the other is 14″ long) vs. either one 4 5/8″ antenna on the standard UV-5R or the slightly better performing 6 3/4″ on the BF-F8HP radio. Of course, most folks will be highly interested in the 10 watts in the TYT TH-UV8000D and ignore most everything else. I haven’t had the chance to test every single feature within these two radios (so far), but I’m impressed with what I seen to date. Audio quality is outstanding. We plan on ordering a lot more of both of these radios, as our first test batch is gone already. There’s really no response to comlaints either, talk to the many people who had the fcc do nothing about valid compaints on things that actually matter. Many including myself use 50 watts wouxun mobiles for murs and some even use frs frequencies. No one is licensed for gmrs anymore these days. Hell i even have a 300watt transmitter, used to be one of the biggest non-interference things the fcc would get u for. Now? Nope nothing. I known people who run the same for over 20 years. This inmature emottionally unstable ham naivity is just sad. just what makes the BF-8FHP illegal to transmit on GMRS frequencies if the Frequency used is in the correct power output range and the user has a GMRS license not a ham license? The lack of a type certification for the radio by the FCC.